I feared the game would be too confusing/difficult for people to enjoy. If you managed to get to the end, feel free to mention it and how many people you won with here! Thank you so much for playing our LD38 game. Your comment is so flattering that I spent the last 2 hours trying to find a way to reply. I'm really glad you enjoyed it, thanks for playing our little game! I definitely agree with you on the sound, I had a lot of trouble just trying to get it realtively balanced in-game, from all kinds of crazy varying volume. I suppose it's my fault for throwing Billy in the deep end, asking him to crank out sounds before the game jam ended. I'm very much so wanting to do a lot more with the audio in a future update, when the judging is over, I think it's really important towards how fun a game feels; so I'll probably go over balancing it when we manage to get around to that. I'm very glad you had fun with the game! And I definitely appreciate the feedback. 57 People is pretty much the same as what I win with, Billy's highest score was 1111 people, but he's painfully talented at these types of games. Very great game! I was afraid it would have taken me much more time but the length is exactly what I was searching for! I left the island with 64 people. This game is friggin' great. I've beat it three times, my max is over 300 people saved. I would love to see more. Is there somewhere to get the song from the end? You can now download the OST the same way you download the game. 300 people, huh? You're better than me. Billy's highscore is 1111. It's amazing to know that people like the game enough to play through it multiple times. Loved the game and would be thrilled to see more of it! After a couple complete playthroughs, trying to maximize the size of my city before launching my spaceship, I still couldn't really figure out what the walls were for? 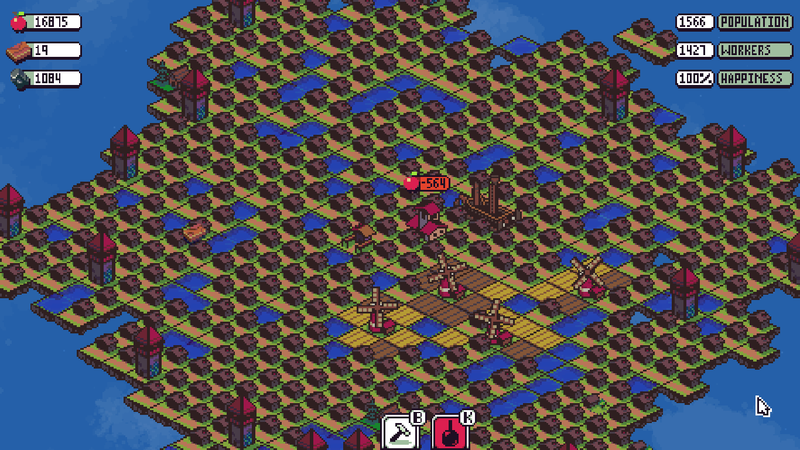 I found that the arrow towers were more than enough to defend my island. I was really liked the song at the end. I wish that the game would calculate a score or something based on how long it took for me to launch my spaceship and how many people I had on it. We're hoping to get an update out soon-ish, and having a final score at the end would definitely be something I'd be happy to include! In terms of the walls, they were originally designed to mostly help against pirate footsoldiers, but we didn't have enough time to get the ground-based combat in the game. The barracks was also supposed to be where you made your own footsoldiers from. I'm glad you enjoyed the game! And thank you for the feedback. Played it and won with 107 people. Took me a while to realize that you needed to click the farms and orchards to get the food. I was definitely expecting the pirate attacks to get increasingly more difficult, but didn't seem so? Really cool game. I liked the art and music, the sound effects weren't too annoying, reminded me of Game Dev Tycoon's bubbles, haha. Good atmosphere and I was hoping for a new level at the end! I've been kinda thinking of making something similar, because I love to do map generation and city builders. Came across this today from a RockPaperShotgun article and have to say it's simplicity while being strategic is great, love it! My first game just playing to get through it, I managed to save 94 people. I decided to play again and finally got tired of waiting for new land to spawn and saved 823 people. My biggest 2 "complaints" right now are a lack of ability to pause (and/or save) the game as well as to adjust audio/music volume. Overall super fun though, thanks! Really loved the game. Hope you'll develop it further as it's quite amazing. I did beat it on my first try with 80 people, but almost lost it all when my wood / stone production cratered. That caught me by surprise. I wasn't expecting the forests / mines to give out, but I guess the game would have been too easy if those were everlasting. If you ever do a final score at the end, I hope you'll have it weighed in two directions, or give two different scores. One measuring how big & complicated your settlement was, and one rewarding the minimalists who managed to survive X number of turns with relatively few. I could see both strategies being viable challenges. Do you have any ETA for next update ? Where I can follow development of next update ? Edit: I was lucky that I finished game at first run, I managed to leave island with 89 people. Took me some time to realize that mine/lumberjack can destroy land. Some stats about income would be useful. I feel honoured that you like the game this much! Thank you. We're not too sure exactly when the next update will be ready, we're hoping to get a smaller update out soon after the Ludum Dare judging ends. If we're lucky, we might be able to fit some of the bigger stuff we had in mind in there too, like the blood moon. There's currently no way to follow development, but it seems like it'd be a really cool idea! I'll make sure I talk to Billy about it when I can. Just finished the game and I really enjoyed it! Finished with 46 people. My main complaints would be around the combat/defense. The first time a ship showed up I felt like there wasn't much warning, and I didn't have the resources to build a tower at the time so I lost a large chunk of the land while waiting for enough resources to generate to build a tower. After that first ship though I built a few towers and it felt like there was never a threat again. The walls weren't really necessary and I though the building for speeding up towers would be necessary later but it wasn't. Maybe give more warning for the first ship, and have harder ships later as a solution? The game's interface was mostly good, but it took me a bit to figure out you could right click to unselect something, always having something selected early on while trying to click resources was a bit frustrating. Also the highlight for which tiles you can collect resources from are occasionally hard to spot behind buildings. One last suggestion is that I wish I could see my finished town after completing the game. Showing it at the end or having a screenshot/share feature at the end of the game would be neat. Despite mainly mentioning my few complaints though I don't want to leave the wrong impression. I liked the game quite a bit, keep up the good work! Finished this game on my first try. It seems like expanding on this game could be done quite easily, which would be great! The cutesy art style is quite striking and the music is quite catchy. Lots of potential! Beat it and really enjoyed it. It took a few tries but I feel like I figured out "the system" eventually after which it became quite easy. The pirates never seem to become much of a threat, and placing an archery tower as soon as they turn up is usually enough to deter them succesfully. It would be nice if there was a way to see how many of each building you have - the lumber and mining shacks are not always easy to see and it's useful to know how many you have generating income for you. EDIT: Beat it multiple times, lowest was around 85 people and highest 110+, but it could be higher I suppose - there is a point after which you could conceivably expand infinitely. Sweet lil' game gem. It took me a second try to understand the harvest mechanic, but then it worked pretty well and I succeeded to build a ship and rescued 54 people. Done with about 72 people. Will sure try again many times and recommend it to friends. A well balanced and fun little game for short play (i.e. aiming to complete the ship as quickly as possible). Not so well balanced for long play (i.e. aiming to maximise population) because of the slow rate of land area growth. If aiming to support long play maybe make tweaks such as resource and built tiles becoming blank instead of being deleted when the resource is depleted or the building destroyed, or making the tile spawn rate proportional to population. Pitching in to call this a great game. IT's just so well polished and rounded, everything synergizes together, from the UI to mechanics to "lore" (whatever little there is). It does seem too easy, as others pointed, but it definitely comes off as a "relax and build" game rather than a "I want a challenge." The only criticism is that I would not care to reply it again as it does not have enough complexity to warrant multiple playthroughs. Which is totally fine for a small LD game, and it doesn't necessarily need to be replayable. Amazing game, loved every minute of it, great look and feel. I saved 110 people and brought them to a bigger world. Beautiful ending/end demo! Just beat the game with 72 people! I didn't read your page fully so the end was a fun surprise! I had no problems figuring out to click for resources, but it took me a while to figure out that mines/lumber yards give out. -notification somewhere when a mine/lumber yard has run out. -maybe the ability to put certain resources into the ship? I don't know, those are just off the top of my head. The lack of feedback in the game, like what you mentioned with the mines/lumber shacks, has been really bothering me since release, since stuff like the resource depletion was added last minute to balance the game better. So I can't wait to get these things fixed, once the game jam is over. The idea of having a notification for incoming pirates is a very good idea, I'll definitely look into doing that. The pirates are actually supposed to naturally ramp up in difficulty over time in the game, but I probably broke it in the updated version and didn't notice, much like how I didn't notice that the game's window still has the dumb name that I originally gave it. I also agree with you on being able to put individual resources into your ship, I'll have to look into the best way of doing that, while still keeping the UI as simple as it is. I'm glad you enjoyed the game! And I really appreciate the advice and ideas. Thank you. I quite enjoyed my one and only run through, though I got called away from the computer and with no way to pause or save it ended badly for my town. Some instructions might be handy.. like the fact you need to click on things to harvest them! Overall though it is a great fun little game. As per the other thread here though... it is being detected as infected by BitDefender, so cant play it now. Nice game! I played it twice and won easily both times. I was initially confused with the difference between population and "workers", but figured it out. Figuring out that clicking is necessary to harvest resources wasn't hard thanks to the blue glow. On the first run I didn't buy the "Storehouse" because I wasn't sure what it did, but I got it on the second run, and it made the game way too easy. I think it would be better without that. The winning strategy I used both times was to ignore farming completely, and instead just prioritize planting apple trees next to every water tile. Since they harvest pretty quickly and only cost food to build, and don't need any workers, you can easily support a whole bunch of workers as soon as the trees are developed. Then you just wait for mining and forest tiles to appear, and create mining stations when they do, since population isn't limited by food. When a pirate ship comes, you just build a tower and an adjacent shoot-fast building, and then pirate ships won't knock out any tiles, so they're no problem. I really liked the game! I had more fun the first time I played it, though, without the storehouse. Today's update made the game more difficult, so that's good news! :D I had my first loss right after switching to the updated game, because I underestimated it. Game #2 was a victory now that I knew what to expect, and I look forward to playing again with the difficulty set to high. Keep up the good work! During my last game I did think of one thing that would add a new challenge. Eventually I had a stable ring of towers to guard my lands, and I never had to worry about anything on the inside. Occasionally a group of 2 or 3 pirate ships in the same spot might destroy a few tiles before the towers sank them, so the outer ring wasn't used for anything too important. What I'm imagining is a way to keep the center of the island in some danger too, in the form of a different pirate ship type. Instead of firing its cannons, it could sit for some number of seconds doing nothing, and then fire a flaming catapult a random distance inland from the coast. Wherever the shot landed would be destroyed, or if you wanted to get fancy, have it animate burning for several seconds before finally vanishing. Something like this would have made my last game much harder. You've probably already considered upgrade buildings, but those are usually an easy way to add some depth to a game, even if the upgrades themselves don't do much. Perhaps a bakery building that, when placed next to a windmill, causes all incoming food to be increased by 10%. Similar buildings could boost stone and lumber income. If you go this route I'd hope their bonuses wouldn't stack as you built more (that would become overpowered), and that they'd be quite expensive so that many players will flat-out never use them. The "never use them" line probably seemed strange, but I don't think it helps as much if upgrade buildings are always going to be used. The auto-food collection building is an example of this, where I would imagine everyone buys it sooner or later. Manually collecting food after you've got a few mills going, is just too time consuming, and at a certain point that building is a necessity. That is perfectly fine, and I don't think it should be changed, but to bring depth it is good to have things people can completely opt out of using in order to develop differing strategies. The apple trees fall into this category. I've read that some people use them every time, and I've only used them once. We aren't all forced to play the same way. Because towers are locked in a fixed position, defending gets tricky. This is good, but it also helps entice players into spending their hard-earned resources on a different way. Perhaps an expensive building (or a re-purpose to the current ship yard should you decide to change how a person "wins" this game) would let players dump resources in until a ship was created. This friendly ship could slowly circle the land and exchange cannon fire with pirates it runs in to. This would be an expensive way to guard against gaps in the tower defenses, until new land showed up allowing the gaps to be sealed. The small house is something I've never used, but I hate to suggest removing it because other players may actually use them. If that house turns out to be unpopular with everyone else too, then it may be a good idea to re-purpose it. I can see the current larger house taking the place of the small one, and then a larger mansion/apartment/whatever being an expensive upgrade. Clicking on buildings and then choosing to upgrade works in many games, but I don't think it would work well in this one. The interface only makes us worry about clicking to collect resources, and I wouldn't want to see it cluttered up. It might be nicer to have the expensive super-house so that it can only be built on top of existing smaller houses in the same way you can only build a quarry on top of a stone tile. That approach to building upgrades would allow the interface to keep the same feel that it currently has. My above suggestion about a bakery would be much better as a mill upgrade (placing bakery on top of the mill), but I didn't want to explain what I meant by that at the time. Water/pond tiles could sometimes start with a tiny fish icon on it. A new building could be a little fishing boat sitting on the pond that collects food for a short while. Once depleted it would revert back to just the current water/pond tile. Eh, I should stop rambling now, haha! Please don't take any of these ideas as "demands" or even requests... they are just ideas to maybe inspire you guys in some way. We've actually had many of the same ideas you've suggested there; the fishing huts and the small house being upgradable into the larger house. The smaller house is, i think at the minute, more of an emergency worker supply for a tower- without spending the larger resource amount on the larger house => not having enough resources to build the tower you wanted originally. in the latest update we think we've improved the apple tree's overpowered-ness, by making it so the stockpile only auto-harvests farms; leaving trees to be manually harvested. We really aren't sure yet- but right now, our 'storyline' setup would be more level based- with each level bringing in something new. I got 1704 people before I decided to stop and finally get around to playing Skyward Collapse. Some way to destroy water tiles besides just letting them get attacked would be nice. To not make it too easy maybe if you unconnect 1-3 tiles from rest of the land(by building and then deconstructing around them) they'd collapse by themselves. Overtime I noticed that amount of wood spawned was always too little but I suppose you are meant to use apple trees for that but in a large settlement they seem like too much trouble, auto harvester getting the wood from depleted apple trees might help with that. I'm so happy to see someone use Little Lands to create their own little cute cities. Creating my own little towns has always been my favourite thing in games like this, but sadly, as you've experienced, the game isn't very city design-friendly. We're about to start working on the full retail version of Little Lands, since we've got so many complex ideas that we can't wait to get into. The ability to design cute little towns; with gameplay benifits to doing so, in order to encourage it, is something I definitely want to spend a lot of time carefully implementing. Here's my write-up for the game! The highest population I got was around the 200 mark, though I definitely could have kept going. I'm wondering, what other features are you planning for commercial release? I had a great time reading your piece about it; I can't express how flattered I feel that people would write about the game. Thank you. 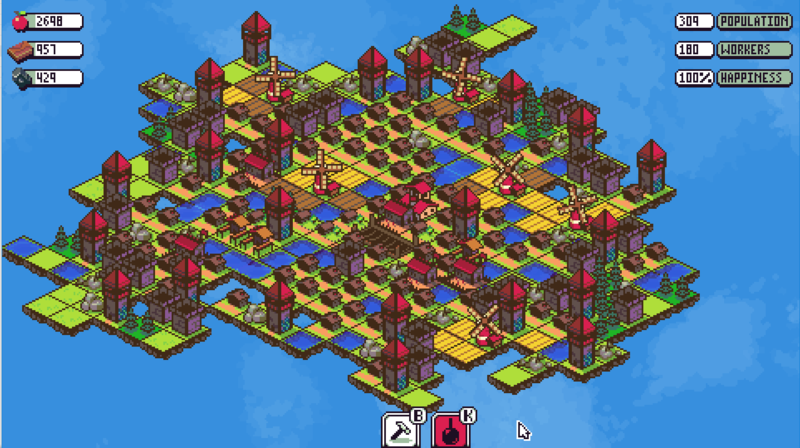 - Designing cute little towns has always been a big thing for me, so I'm definitely planning on having plenty of cosmetic stuff for you to play with, I'm also going to make sure the mechanics incourage it. - Terrain height. For example: building on hills would be benificial, as it'd take longer for enemy footsoldiers to walk up slopes, giving you more time to attack them. Definitely grabbed my sight due to the design. Enjoyed it for the time I played it. I enjoyed the satisfaction of getting to such production that I was making more than I needed and could finally grow freely (finished with 84 people on the first game, pretty much could've gone up to ~200 easily). That said, on a second playthrough I got screwed over by the random elements (didn't get enough trees) but I got through it just by knowing how to play it already. I love this cute game :) I created an Itch.io account just to comment here (as others have). Looks like you have big plans for it, good luck developing! I wanted to point out a potential problem with the game: your "workers" count does not go into negative. This means that if you assign all of your workers to jobs (such as lumber or mining), you can now destroy their homes and they'll still do their jobs (which is beneficial because it lowers your population, so you don't have to pay food for those people anymore, and you can now use that land for something else). If you have a very high food cost for the night and no food to pay for it, your happiness will go down until you get game over. But then on the game over screen, the happiness will start to go back up as you're still being charged for the food in the background, and it can even go way over 100% (does this suggest that the afterlife will make us happier than we can imagine? just kidding hahaha). I think it's fun to surround a windmill with farms and then destroy the windmill. It's like setting off a bomb hahaha. I would suggest a way to get rid of water tiles. Perhaps a fishing dock. And I would suggest that when you're hovered over the square behind a tall structure (such as an archery tower), that it would make that building invisible (or an outline) so you can see what is behind it. Love trail and error and finding things out with no handicaps. Took me awhile to figure out I had to manualy harvest food. This is a really great game was sad to find there was no real end in terms of accomplishment. Maybe after making the boat the game switches to building up the boat and making it better and defending against pirates and meteors then you go to another plannet and you start out with ALOT more land but fewer resources and more pirates. Maybe then storms could start with fire. have some plagues or rats ruin food stocks or have to repair buildings or something. Maybe a lighthouse building that searches for land faster causing it to apear faster. Finished my first run with 97 people. That was fun - the resources collection thing nearly cost me the game early on. The indicator should be a bit more noticeable. On the first run I didn't realized that you needed to harvest manually the farm (maybe because the other building are harvested automatically and that the apple tree doesn't need workers). The possible improvements I could see would be: a button to restart (or go to main menu), information on farms and shipyard (and maybe on town hall, just to say the current food consumption), tower radius (to see the range). I played your game and I loved it I replayed under several difficulties, I succeeded and failed several times but I loved it played. Will there be any further improvements? - Adding houses to nv3 as well as a system of increasing houses already laid. - Added a menu of pause and save which could help us to be able to play from time to time without losing our current part. - Add an option with natural disaster like small meteorite / lightning / etc ..
- Add fishing building and park. - And last idea (a bit too ambitious I think) create a second part after the boat that would be either infinite or a higher level with more stakes farm and difficulty like adding additional resources to have to harvest, Other potential buildings and other potential enemies. In any case, I would like to save as I can make videos on it for make small challenges and so I can stop to recover my progression again. I apologize if my English is very bad, I await your response and look forward to this wonderful game. Very interesting how you managed your island! 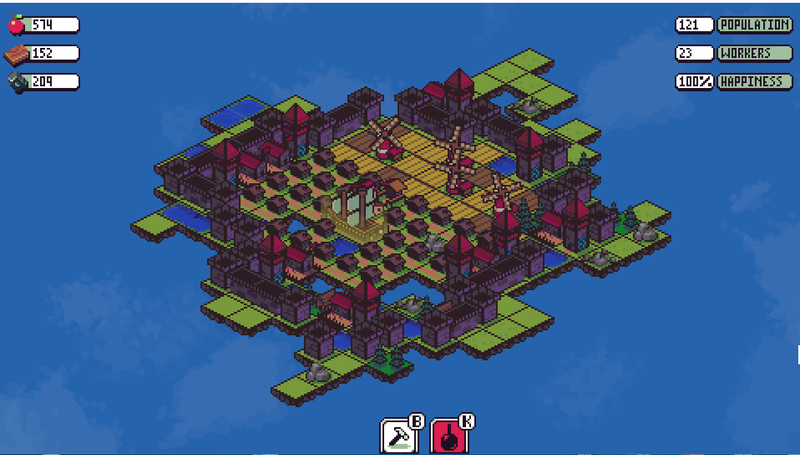 Now I have understood all the features and I try to create villages at each trial. Congratulations to you both for making this amazing game! I'm very proud of you for making this hard game! I'm looking forward to updates! Ay!! I loved this so much. After playing this like 50 million times and gitting gud, I managed to save 7304 people on my last run through. Prolly my final one until this gets updated. I hope you keep it up! I beat it with over 2000 people and I had over 900000 food and more than 5000 of wood and stone by leaving it overnight, the building that collects food is overpowered, it should have something like a range of food it collects. Very amazing game. It took me two failed tries until I got how the game worked and then got to beating it. The pixel art is simplistic and easy on the eyes and the main game mechanics weren't hard to understand. Little Land or Big City ? I enjoyed this game a lot !